I'd like to take a break from the play-by-play reports from the last couple of weeks to foray into the Soulbond mechanic and my own take on one possible incarnation in the Block Constructed environment. The Soulbond mechanic has proven itself to be very powerful in Limited play, and I'd like to survey where we could potentially see it in a Constructed world. This deck feels a little slow for the format, so I wouldn't necessarily expect it to be taking home any grand prizes, but it's a good starting point for exploring the mechanic as a whole, and some meaningful interactions with other cards in the block. I was considering an aggressive Red/Green version, but I decided to go with Green/White instead, slowing down the game plan by a turn or two, but getting a bit more power out of the exchange. You can check out the deck list here. In case you're not familiar with Soulbond, the ability reads "You may pair this creature with another unpaired creature when either enters the battlefield. They remain paired for as long as you control both of them." This means that if you have a creature in play when you cast a Soulbond creature, you can pair them up as long as neither is already paired. On the other hand, if you have two creatures in play that are paired together and you cast another Soulbond creature, you are not allowed to pair him with either of your creatures. They are paired permanently, at least until one of them leaves your control for whatever reason, and cannot be re-paired. This makes it particularly important to only pair creatures that you want to stay together, lest you end up with an underwhelming board position of paired creatures that don't play well with each other. Now, as to the deck, in White I've only included the one, Silverblade Paladin, who grants Doublestrike when paired. He can be cast as early as second turn off of Avacyn's Pilgrim and, just looking at Mirran Crusader, we know how strong a turn two 2/2 Doublestrike can be. Of course, it's often the correct play to wait to pair him, but you have the option early for defense if need be. 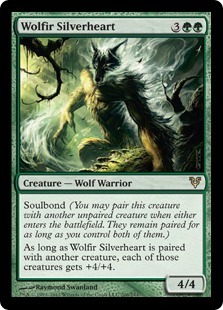 Next, in Green, is Wolfir Silverheart which grants a +4/+4 buff to each creature when it is paired. This guy plays well with almost everything in the deck, and can be powered out early with mana acceleration. He pairs up with Champion of Lambholt to make blocking virtually impossible for your opponent, barring them having their own six-powered creatures already in play. Wolfir Silverheart also teams up with Pathbreaker Wurm for 18 Trampling power, which helps against a field full of chump blockers. Finally, Pathbreaker Wurm teams up with Silverblade Paladin for a Doublestrike Trample effect, which can crush an unprepared opponent. As far as utility goes, Joint Assault is just a combat trick with some extra oomph when cast on a paired creature. It can sneak some extra damage through, or just help you trade up during combat. It may be redundant with so much raw power on the creatures, but every little bit helps, and it jives particularly well with Silverblade Paladin, providing an additional 4 Doublestrike power. Righteous Blow is strong against the first-turn plays of the format. It kills Champion of the Parish, Stromkirk Noble, and even a flipped Delver of Secrets, all of which can get out of hand pretty quickly. It is fairly limited in what it can otherwise do, however, so I only included three in the main deck. We've also got Garruk Relentless, which acts as removal for a small creature, or to provide a steady stream of blockers as needed. You can also use his tokens to pair up your unpaired Soulbond creatures to get the buffs if you're having trouble drawing creatures. Gavony Township is cute here, but possibly unnecessary. I believe the mana base is sufficient enough to justify a two-of inclusion, however, and it can make even your mana creatures into legitimate threats while also pumping up Champion of Lambholt. Finally, Ulvenwald Tracker is going to be our higher-end removal. He's reusable and when he's working with an 8/8 Wolfir Silverheart, virtually nothing in the format really stands a chance. Avacyn's Pilgrim and Dawntreader Elk help to push you into more powerful creatures faster. They're essential here, I believe, because the format is so fast in general. With our threats starting at three mana, we just need a way to get them on the ground sooner. Four Avacyn's Pilgrim and four Dawntreader Elk can get us to five mana as early as turn three, enabling both Sigarda, Host of Herons and Wolfir Silverheart. As to actually playing with the deck, we're ideally going to lead with Avacyn's Pilgrim. Dawntreader Elk is a runner-up, slowing things down by a turn, but usually blocking some damage before sacrificing itself. Against the more aggressive decks, leaving up a White mana for Righteous Blow is going to be pretty crucial, as you'll usually only have one opportunity to take down a Champion of the Parish before he gets out of Righteous Blow's range. 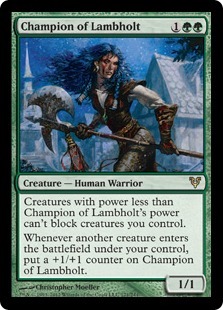 Otherwise, from what I've seen, with so many little creatures running around, leading with Champion of Lambholt can be a solid start and guarantees you a shot at racing by making your team largely unblockable. Sigarda, Host of Herons holds down the air all by herself and her evasion makes her a solid win condition. If you're not lucky enough to get an early Champion of Lambholt out for his evasion, you'll want to get your Pathbreaker Wurm out to start getting in for Trample damage. With Riders of Gavony as a potential inclusion in some Humans decks, I think the diversity of our threat types is also important here, with only a handful of any given creature type in the deck. In the end, you're usually going to need two threats in play to end the game, as is the nature of the Soulbond mechanic. This is a definite downside to the deck, but the inclusion of 17 threats should make it more palatable.